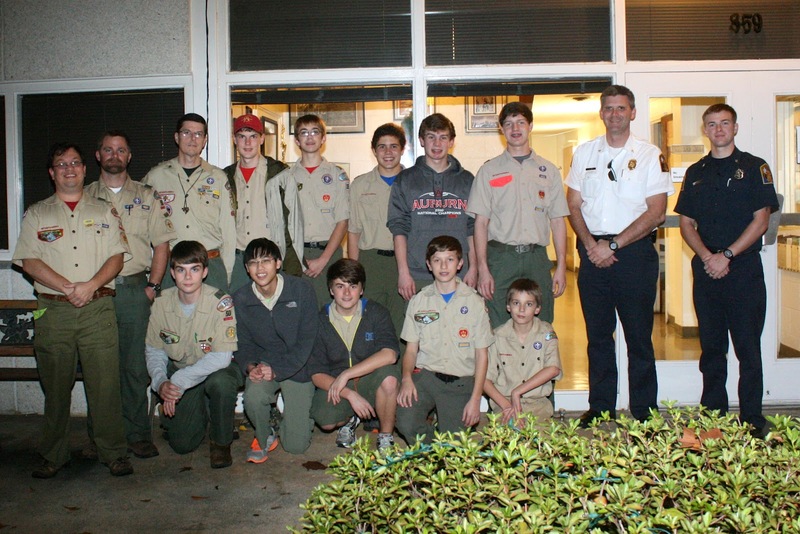 Scouts and families came together for the troop's December 17th meeting to celebrate Christmas with food, games and a Toys for Tots toy drive collection. Following dinner, Scouts attempted to stump the scoutmaster with a knot of their choice, then the scoutmaster in turn stumped Scouts through a couple of games that seemed to demonstrate a level of psychic ability among the troop's adult leaders. The event ended with Scouts and leaders walking the nearly two dozen toys to the Auburn Fire Station as part of the Fire Department’s annual toy drive. Pictured kneeling are (L-R): Ethan S., Vincent C., Will P., Andrew S., Josh F.; standing (L-R): Troop Committee Chair Rob Stanford, Assistant Scoutmaster Jason Smith, Scoutmaster Andrew Baird, Davis B., Robert P., James Robert A., Kyle S., Davis T., Battalion Chief Matt Jordan and Firefighter Douglas McElvy. Check out other photos from the night in the troop's online photo album.